Ride-a-Bike Right can get you and your family riding safely. Confidence and skill development for children 10 yr+ to ride on the road. 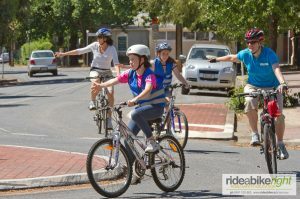 This 3-session course will teach your pre-teen about the safe and practical ways to be riding in a low traffic environment, great for riding to school, the shops, spending time with friends or on a family outing. Giving children the skills, confidence and independence to ride their bikes safely around your community. Improve cycling skills and learn how to become a road user as a cyclist. Skills are taught through games and challenges that allow the learner to progress and achieve, with time given to develop skills before they enter low traffic environments. On road skills include how to pass parked car; left, right and hook turns; roundabouts; responsibilities and rights of cyclists; safe route planning, bike security and safety as a cyclist. Buying a bike: If you don’t have a bike as yet, we suggest that you wait until after your 1st lesson before you buy a bike, you’ll be given info on which style and size bike will best suit your needs.